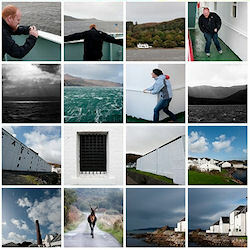 Me and my mate Ross thought it would be a good idea to do a distillery tour of Islay at the beginning of October. As you can see the weather was..... unsettled. It looked rather breezy during their ferry crossing, but then again there was also sun and blue sky over Lagavulin. It looks like they did at least some birdwatching and were held up by at least one mobile road block.